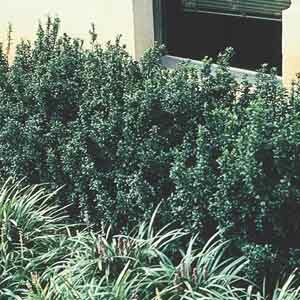 Incredibly easy and carefree, this evergreen shrub looks great year-round. Tolerates drought and salt spray, making it a good choice for coastal slopes or other difficult locations. Small white flowers are not showy, but add interest in the summer and are enjoyed by bees and butterflies. Prune freely to maintain the desired size and shape. An excellent specimen, foundation, or border plant. Best used in groups and shrub borders. An ideal choice for hedging. Provides nice color and form to the winter landscape. Very easy to grow in virtually any location. Plant in ordinary, well-drained soil. Tolerates drought, but looks best with regular watering. Trim back as needed.